If you are looking for a budget-friendly yet quality camping tent that accommodates up to 4 people then meet Coleman Sundome. 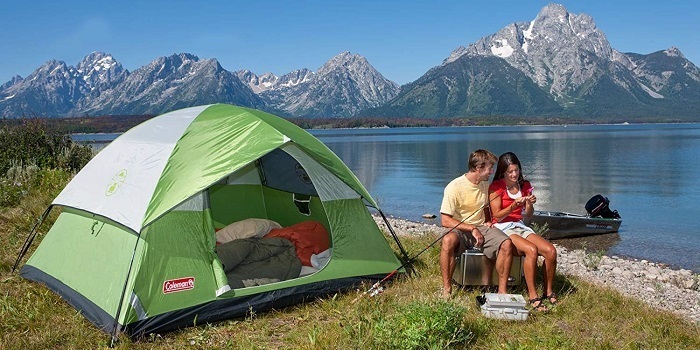 In our list of Top 5 Best Camping/Backpacking Tents is ranked at #1. Coleman Sundome comes with a freestanding design that means you can put the tent together and place it in any location before staking it to the ground. They are stronger, bigger, and heavier than their non-freestanding counterparts. 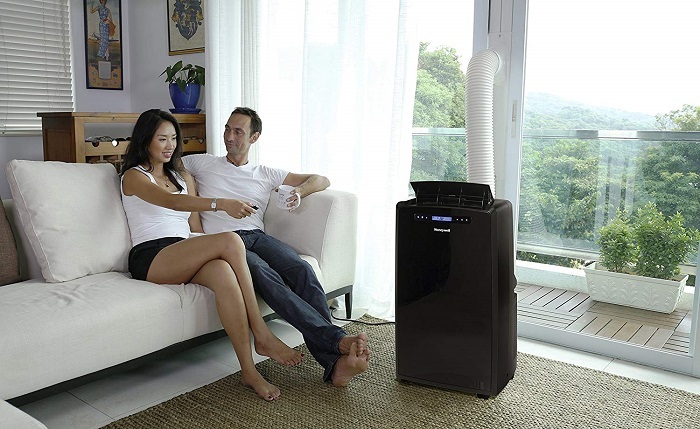 The dome-shaped design offers the ease of disassembly and packing. Simply pull the tent stakes and poles and roll the tent. 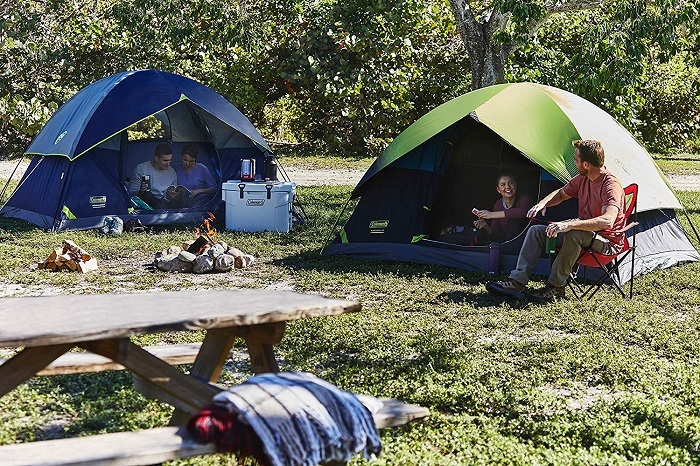 This 4-person tent is available in 3 color options – [Green $53, Navy $63.99, or Green/Black/Teal with Dark Room Technology $89.99]. For easy setup, Coleman Sundome comes with continuous pole sleeves and a patented pin-and-ring system which speeds things up during set up while the snag-free suspension makes things less complicated. Although the tent is a 3-season tent, but it isn`t designed for heavy rains and winds. So it will be best for use in the summer or mild weather. With a sleeping base of 63 square feet the tent is more than enough for four individuals, and with a height of 99 inches, there’s enough space for tall people to stand up in the tent. However, it would be better if you count the tent accommodate 2 to 3-people, so you have more space to put your backpack or others inside the tent. This budget-friendly camping tent comes with large windows and a ground vent for superior ventilation. For the floor, the tent is equipped with WeatherTec system with patented welded floors and inverted seams to keep you dry. Furthermore, the strong 1000D polyethylene tent floor (similar to a bathtub that wraps around all sides), provides total protection against water leaking. There are built-in storage pockets which you can use to keep your belongings in giving you plenty of room inside and reduces clutter. Another important and useful feature is the addition of an E-port, enabling you to charge your phone or use other electrical devices. • Doesn't require a lot of maintenance. • Packs away compactly in the included carry bag. • Sets up in only 10 minutes - only takes one person. • Well made zippers - run smoothly, don't get stuck, and doesn't get affected by water. • One door access only. • The zippers are not heavy duty. • The tent doesn't come with a footprint. • Not suitable for heavy rains or extreme cold. • The mesh vents are not covered by the rain fly. • Vulnerable to leaking at the seam where the sides meets the floor. If you don`t want to spend much and need a tent that accommodates up to 4-people then Coleman Sundome is your best choice.